Home / Arborists / What’s Inside an Arborist’s Toolbox? Ever wonder why the guy pruning the tree in the backyard looks like inspector gadget? Well, frankly speaking, it is because being an arborist requires a lot of specialized tools. Just like a rock climber wouldn’t ascend a cliff face without the proper gear, the same applies for those of us who make our living amongst the leaves. Need help identifying all those tools? Here’s a handy guide to the elusive arborist’s toolbox. 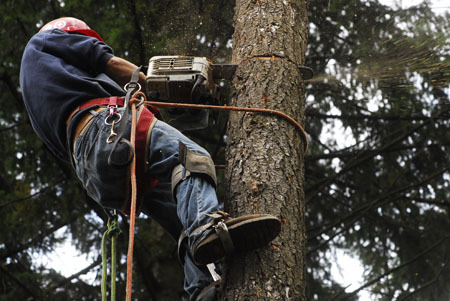 Most everything you’ll find an arborist using falls into one of three categories: cutting, rigging, or climbing. Although cutting tools may be the sharpest tools used by an arborist, they aren’t always the most dangerous. Typical tools in this category include polesaws, pruners, hand saws, tree loppers, hand pruners, hedge trimmers, axes, hatchets, and the oh so famous, chainsaw. There’s plenty to say on the matter of chainsaws – stay tuned on our blog for our next post dedicated to this powerful tool. As for rigging tools you’ll see blocks and pulleys, friction brakes, slings (light and heavy duty), carabiners, rigging plates, power pullers, winches, cable hoists, ring slings, and a variety of other hardware bits. We are talking steel rings, rigging thimbles, and a slew of different swivels. Oh, and plenty of rope! Climbing can often be the most dangerous part of being an arborist, so many of our tools are dedicated to climbing and safety while climbing. 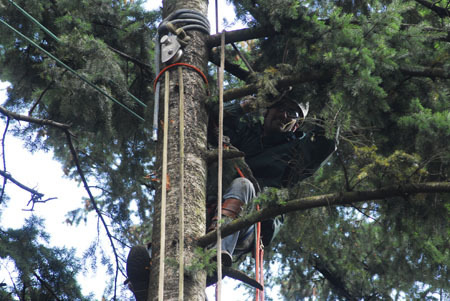 You’ll find arborists using saddles, helmets, radios, gloves to help grip, saw protective clothing, eye protection, straps, and spurs. Also look out for ascenders, descenders, eye slings, tails, more carabiners, and pulleys, and more. A lot of the tools used for rigging are also used for climbing. Expert arborists use all of these tools to safely and efficiently remove tree limbs, prune, and cut down dead or disease ridden trees. If you have hired a tree company and don’t see a lot of these things, it may be time to reconsider. Always look for the word “certified” in front of arborist to know that those working in your yard have had the proper training. Another set of important words that are a must, “Licensed, bonded, and insured.” If you don’t see those, run for the hills or your backyard could end up looking like the end of a scary Halloween movie instead of the peaceful respite it once was. No joke. As always, if you have questions about trees on your property, or need help removing limbs, or a whole tree, give us a ring. We work in Portland and any surrounding areas like Lake Oswego, Beaverton, Sherwood, West Linn, Oregon City, Hillsboro, and more.